Lyle: We are going to explore the rhythm style of U2's - The Edge. The jam track is a simple 8 bar jam, using 4 chords. Lyle: Some of these chords are easy and you might know them. Lyle: Notice that my right hand (strumming hand) is the same motion for both the 8th note and 16th note strumming patterns in the videos. On the 8th note pattern, you'll use all down strokes. Just don't hit the strings on the way up. Try playing these chords and strum patterns with the jam track. 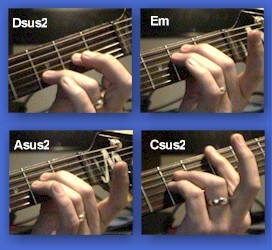 Lyle: The Edge likes to use suspended chords, like sus2, sus4. 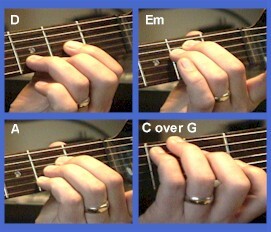 This means you take a regular chord which is built from the root, 3rd and 5th, and move the 3rd to the 2nd or 4th. Lyle: These sus chord offer a big sound. Lyle: This next chord is like a sus2 but it's called an "add9". Lyle: Hear how the addition of the sus chords bring this simple progression to life? There's more harmonic and melodic movement. Lyle: Hope you can see the use of these techniques that define the Edge's style. Strong rhythms, sus chords and the use of delay to fatten it up, along with different chord variations that help give the song some dynamics.